These are the best rubber band cars available. All steel axles spin with very little friction so cars can easily travel over 30 feet. Special wood wheels are grooved to hold rubber traction bands. Easy construction. Plans available for a no-nonsense speedster or a group of four street rods. All plans drawn FULL SIZE. The #1089 Rubber Band Car kit includes metal axles and rolled pin, four wheels, traction bands and three motor drive bands. Order one #1089 Rubber Band Car kit for each rubber band car you make from either plan #W2141 or #W2142. 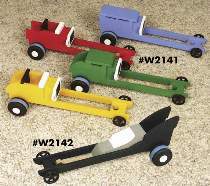 The #1099 Rubber Band Cars Special includes both plans #W2141 and #W2142 and five each #1089 Rubber Band Car kits. Wood and wood finish are not included.